As early as 1927, Maija Grotell was attuned to contemporary ideas of decorating vessels with the linear and geometric combinations of Art Deco motifs. She worked primarily with strong cylindrical and spherical forms, often leaving the clay unglazed, textured only with fingers or tools. 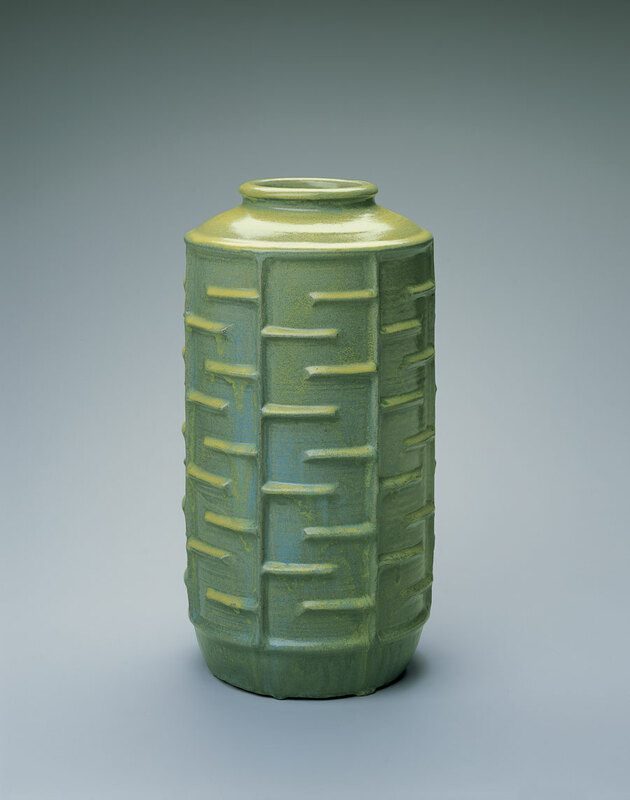 Frequently, Grotell made massive vessels when cleaning up the studio so as not to waste scrap clay, and later became well-known for using the large surfaces for glaze experimentation. While embracing simplicity of form, this immense vase also exemplifies Grotell’s fascination with the depth of layers and patterns she found in nature. Hand-thrown on a foot operated wheel, the vase was textured with Albany slip relief in the pâte sur pâte method of building up layers, creating a geometric relief pattern which, like Eliel Saarinen’s patterns on the Art Museum’s bronze doors, is reminiscent of tree branches. The glaze treatment is also layered with the color of the high-fired stoneware body showing through the blue-gray slip and the glaze of striking yellow-green.